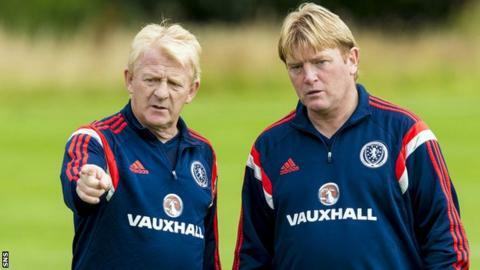 Stuart McCall has distanced himself from the Dundee United manager's job, insisting he is concentrating on his Scotland assistant coach role. Jackie McNamara, 41, has been relieved of his duties at Tannadice after a poor start to the season. And former Motherwell and Rangers boss McCall, 51, was asked on BBC Scotland's Sportscene if he would be applying for the vacancy. "I'm solely focused on the Scotland v Poland game," he said. "I really am and I think it's a game we can go and win. "It goes without saying, Dundee United are one of the bigger clubs in Scotland - really good fan base. "I'm sure they'll have a lot of good candidates, it's a terrific club but at this moment in time I'm just focused on the international scene. "I can't see them rushing into an appointment. The international break is on the horizon next week. I know they've got a big game at Partick Thistle on Saturday." Scotland face Poland and Gibraltar next month in the the final two rounds of Group D qualifiers for Euro 2016 still in contention for a play-off place. McCall, who has been part of Gordon Strachan's Scotland coaching team since early 2013, finished last season in charge of Rangers but could not lead the Ibrox side to promotion after reaching the end-of-season play-offs. He was at Motherwell for almost four years, leaving during the first half of last season after a series of defeats for the Fir Park side. United are second bottom of the Scottish Premiership with five points and only one win from their opening nine league games. They led at St Johnstone on Saturday before eventually losing 2-1 - and McNamara's fate was sealed in a meeting with chairman Stephen Thompson shortly after full-time. Thompson has been in discussions with a consortium of other businessmen to take control of Newcastle Jets in Australia. "That possibly would be a concern for anyone looking at it," added former Rangers, Everton and Scotland player McCall. "I remember when I went into Motherwell, Dundee United were in a lot of debt. They've reduced it, I believe, but there does seem - behind the scenes - to be a bit of uncertainty. "I'm sure whoever goes for an interview or an application would look into the background of it but, certainly, I'd imagine it's a good club to work for."